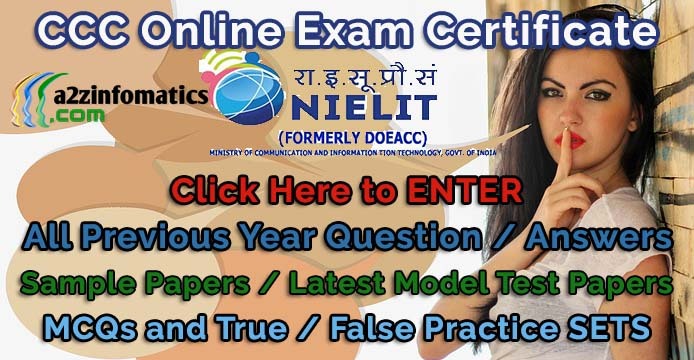 To strengthen the CCC Study Material for the CCC candidates, here is another DOEACC / NIELIT CCC Question Answer / Solved Previous Year MCQ Practice Paper SET-I with the Solution / Answer Keys. 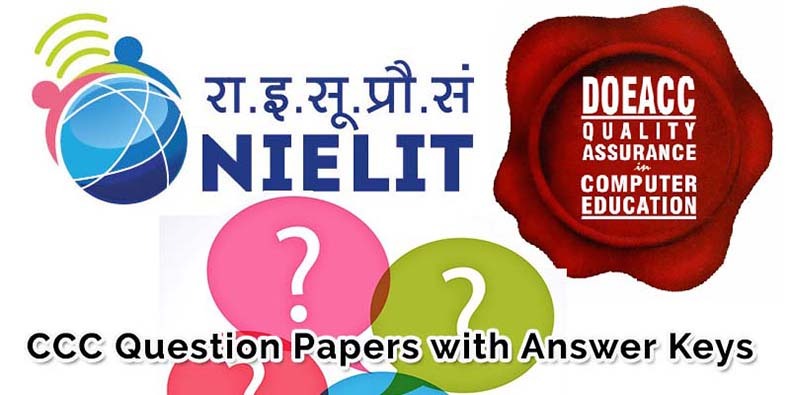 All the published CCC Question Paper SETS with the Answer Keys will definitely prove a decisive factor to crack the upcoming DOEACC / NIELIT CCC Examination at the first attempt. These are the latest 2018 CCC Question Papers as per the latest CCC Exam Syllabus. In last, Best of luck for your coming CCC Online Certificate Examination, don’t forget to visit other CCC Question Answers Sample Papers / Practice Sets already published here at a2z infomatics. CCC Question Answer / Previous Year Solved Question Paper Set-I. Note: This CCC Previous Year Question Answer Paper (SET-I) consist of total 50 question with the answers at page no 4 of this post. Ques 1- Which one of the following is not true ? (a) Kernel is the program that constitutes the central core of the operating system. (b) Kernel is the first part of the operating system to load into memory during booting. (c) Kernel is made of various modules which can not be loaded in running operating system. (d) Kernel remains in the memory during the entire computer session. Ques 2- Which one of the following error will be handle by the operating system ? (b) Lack of paper in the printer. (c) Connection failure in the network. Ques 3- What function displays row data in a column or column data in a row ? (b) placed in a Word table. Ques 5- Except for the ………………….. function, a formula with a logical function shows the word “TRUE” or “FALSE” as a result. Ques 6- Print server uses …………………… which is a buffer that holds data before it is sent to the printer. Ques 7- Which of the following performs modulation and demodulation ? Ques 8- Which of the following communication modes support two-way traffic but in only one direction at a time ? Ques 9- Change the …………………… to create a document in wide format. Ques 10- ……………………. formatting is the process of changing the way letters, numbers, punctuation marks and symbols appear on the screen and in print. Ques 11- Which of the following symbol sets would be most likely to contain a mathematical symbol such as a degree sign, greater than or equal to, or a Greek Letter ? Ques 12- Auto Correct was originally designed to replace …………………… words as you type. Ques 13- Which of the following is called low level languages ? Ques 14- Which of the following is problem oriented language ? Ques 17- Which symbol separates your account name and the name of the mail server name in e-mail address ? Ques 18- Which of the following is NOT a mouse technique commonly used in Windows ? Ques 19- A ……………………. is a collection of buttons which represent various operations that can be carried out within an application. Ques 20- What does the VLOOKUP function do ? (a) Looks up text that contain ‘v’. (b) Checks whether text is the same in one cell as in the next. You are now on the Page No 1 of this CCC Question Answer / CCC Solved Previous Year MCQ Practice Paper SET-I. Complete Answer Keys for CCC Previous Year Question Paper Set-I on Page no 4 of this Post.